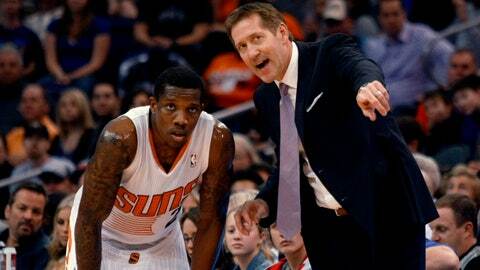 Suns coach Jeff Hornacek, right, talks to Eric Bledsoe during the third quarter Saturday against the Philadelphia 76ers. The Suns won 115-101. PHOENIX — If Phoenix is the NBA’s surprise team, Miles Plumlee is the most surprising Sun of all. The 6-foot-11 center played a grand total of 55 minutes in 14 games as a rookie for Indiana last season, then came to Phoenix almost as a throw-in in the trade that sent Luis Scola to the Pacers. Athletic and energetic, Plumlee has given the Suns an inside presence, and Phoenix — supposed to be among the NBA’s worst teams in preseason forecasts — is 18-11 after beating the Philadelphia 76ers 115-101 Saturday night. Plumlee scored a career-high 22 points, grabbed 13 rebounds and blocked three shots. "I’m happy with my progress," he said. "I feel better every game. I feel like I have more energy because I’m not as anxious on the court, I’m not wasting my energy. I just feel like I can play harder." Plumlee hit the court hard trying to block a shot in the third quarter and required seven stitches to close a cut on his bearded chin before returning to the game. "He is playing hard, making quick moves," Suns coach Jeff Hornacek said. "When we get the ball inside to him, he is very confident with his moves. I think in the beginning he kind of predetermined his moves and what he wanted to do, but I think these last 10 games when he gets it in there he is seeing where the defense is and that’s the shot he ends up taking." Goran Dragic added 21 points and Eric Bledsoe 20 for the Suns, who have won nine of 11 but were coming off their worst loss of the season. Marcus Morris made three fourth-quarter 3-pointers and scored 18. Thaddeus Young scored 30 points, Michael Carter-Williams 27 and Tony Wroten 22 for the 76ers, who lost their 13th road game in a row and have dropped nine of 10 overall. Evan Turner, Philadelphia’s leading scorer at 19.3 points per game, sat out to rest his sore right knee. "We missed Evan, but 101 points is still a nice effort from some of our young kids tonight and from some veteran players," 76ers coach Brett Brown said. "But defensively we just have a long way to go." Phoenix lost 115-86 at Golden State on Friday night. The 76ers hadn’t played in a week and had been in Arizona since Thursday. I don’t think we played a great game tonight. We were OK. That was about it. We’ve got to play better. Dragic said the Suns didn’t play well Saturday, just good enough to win. "We should have been up by at least 15 points at the half," he said. "They had too many easy baskets, especially their guards. In the end, it was a tough game, but I am happy with that win." Phoenix had 31 fast-break points to Philadelphia’s 14. "We’re not going to win games giving up 30 fast-break points," Carter-Williams said, "so we’ve got to get back on mistakes, and that starts with me getting back and when I get back, that leads everyone else getting back." Philadelphia stayed in it for a while with 3-point shooting, going 9 for 16 in the first half to trail just 60-59, but the Sixers were 2 of 13 on 3s in the second half. Carter-Williams and Young opened the third quarter with 3-pointers to put the 76ers up 65-59, then Plumlee scored inside and converted a three-point play to tie it at 65. Bledsoe’s 3-pointer from the corner put Phoenix up 70-67 with 8:32 left, igniting a 15-4 run that put the Suns ahead 82-71 after Dragic stole the ball from Wroten and made the breakaway layup with 4:49 to play in the quarter. Phoenix led the rest of the way. The Suns were up 88-81 entering the fourth. A pair of free throws by Young cut it to 96-90 with 6:43 to play, but Morris sank consecutive 3s from the top of the key, then Dragic banked in a 3-pointer and Phoenix was in control 105-90 with 4:22 left. "I don’t think we played a great game tonight," Hornacek said. "We were OK. That was about it. We’ve got to play better."